Toyota Corp.’s Lexus is leveraging parallels between its brand and an upcoming superhero film to appeal to a cross-market fan base during this year’s Super Bowl. 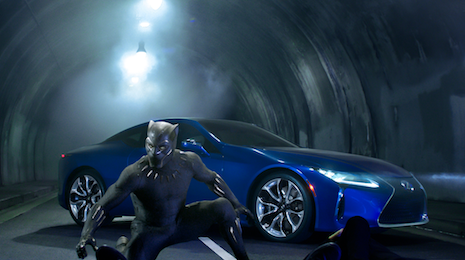 Expanding on its existing partnership, Lexus is supporting Marvel’s "Black Panther" film ahead of its release for its Super Bowl LII campaign. The automotive brand hopes to gain the attention of football, Lexus and Marvel fans all in one spot, while leaning on luxury and innovative themes seen in all franchises. Walton Isaacson partnered with Lexus in the creation of the Super Bowl spot. News of the Lexus-Black Panther partnership came to light as early as July of last year. Lexus put a spotlight on the balance between human and machine in its campaign that takes the automotive brand to the big screen. 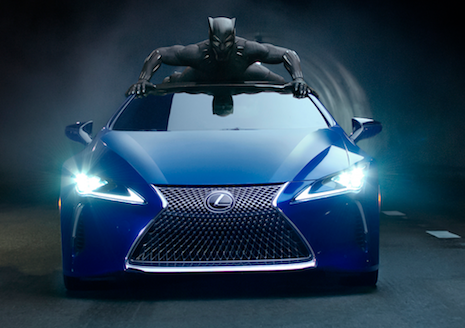 Teaming up with comic book conglomerate Marvel, Lexus will actually be featured in the upcoming Black Panther film. Coupled with special events and a special graphic novel, the automaker has been hoping the campaign will appeal to a wide range of superhero fans (see more). The auto brand even took its collaboration to the next level with an inspired concept model. Among appearing in the film, its Super Bowl campaign and its other campaign pieces, Lexus celebrated the partnership by creating two new vehicles that represent the film. A fictional material named Vibranium is the inspiration for the look of the reimagined LC Coupe, which sees the car glowing in a vibrant blue (see more). For this leg of the partnership, the Super Bowl commercial was created by both the Lexus and Marvel studios, which will likely make a powerful impact with a cinematic look and feel. Many scenes from the film itself are featured in the spot to make it more authentic, but other personnel were involved as well. Lexus looks to Black Panther for its Super Bowl campaign. Image credit: Lexus. 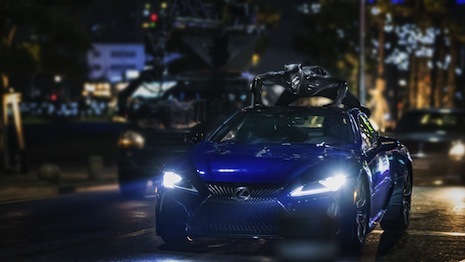 A 30-second version of the “Long Live the King” ad will feature the main character, portrayed by actor Chadwick Bosemann, driving a Lexus LS 500 F Sport as he recovers stolen Vibranium. The Lexus vehicle is designated as the only car powerful and luxurious enough to complete the task. Original costumes and props, the fight choreographer and VFX studio from the film were used to shoot the ad, keeping a level of consistency. Premiering during the most-watched television event of the year on Feb. 4, the spot hypes up the film before its release on Feb. 16. A full 60-second version of “Long Live the King” will be released on online channels to give interested fans a more in-depth look at the creation. Lexus hopes to capture football and Marvel fans. Image credit: Lexus. To make the spot more thrilling and impactful, the advertisement features the song “Legend Has It” by Run the Jewels. The song is comprised of intense, attention-grabbing beats and made the top spot on Billboard's Top R&B/Hip-Hop Albums chart. “This is a case of go big or go home,” said Aaron Walton, cofounder of Walton Isaacson. “The stakes are higher if you don’t have a vision. “The Lexus launch and the Black Panther launch transcend a car and a film launch just as the Super Bowl transcends a football game,” he said. “Each, in their own way, are game changers and celebrations of excellence and innovation.